Facebook today announced Marketplace, a dedicated place for people to sell and buy goods in their local community. Marketplace is an evolution of swap-and-sell services that have sprung up within Facebook Groups over the last few years. Facebook Marketplace is a more legitimate tool meant to help users discover, buy, and sell items with friends and neighbors. It competes with services such as Craigslist. Marketplace is located front-and-center in the main Facebook app. People can browse through Marketplace or search for specific items via categories such as electronics or furniture. Tools allow people to search in specific neighborhoods or towns, and on the flip side sellers can set the general location of their items without giving away their home address. Interested buyers can reach out to sellers through the Marketplace app to communicate about availability and price, as well as arrange drop-offs and/or pick-ups. Facebook says it does not facilitate payments or deliveries, which is up to individual buyers/sellers. Facebook Marketplace is rolling out to Android and iOS users in the U.S., the U.K., Australia, and New Zealand. Facebook says other markets will follow over time. 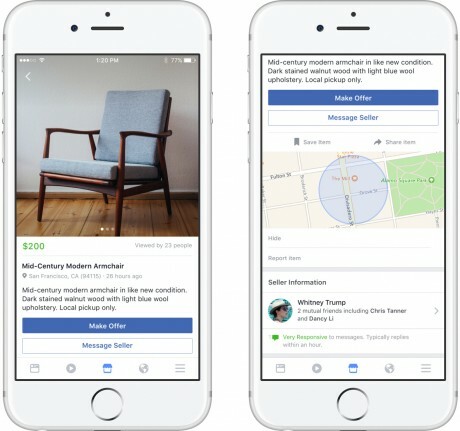 Facebook believes artificial intelligence will benefit buyers and sellers who use Facebook Marketplace. Moving forward, Marketplace will rely on several AI-based features to improve the usefulness of the neighborhood sales tool.